Let your eyes shine with beautiful golden colour thanks to Star and Jewel Gold lenses from ColourVue. Perfect for big nights out and romantic dates. Two 90-days disposable contact lenses. 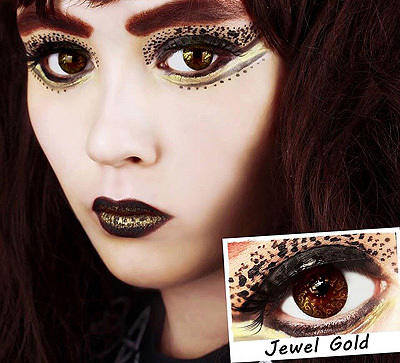 ColourVue Star and Jewel Gold contact lenses were designed for all those who like to look fashionable and unique in the crowd. With these lenses you will surely achieve these goals as they are one of a kind. They feature a lovely swirly pattern and a shiny, gold colouring which makes them very glamorous and classy. Wear them with evening make-up and let your eyes mesmerise people. It doesn't matter what colour your natural iris is, ColourVue Star and Jewel Gold will look fabulous on everybody.